Today is the today we head to Birdsville. I’ve never been to Birdsville before; Damian has but many moons ago as a younger man on adventures. I’m rather excited by the prospect of today’s drive. While 386km seems an easy drive (really, that should only take 4hrs right?) – add in all the corrugations and we were told that the trip is more like 8hrs plus. We stopped in at Windorah which is a sweet little town with way more caravan parks and places to stay than I expected – til I realised that this is pretty much the last stop before Windorah. Damian had the foresight to head into Windorah late yesterday evening before the servo closed up the for day and fuelled up with virtually no one else there. Different story this morning as we passed through – heaps of cars waiting to fuel up so I’m glad we didn’t have to waste time in the queue. Well done Damian! I guess there’s not a lot to say about the drive itself. Pretty straight forward. What struck me in particular was the absolute vastness that greets your eye wherever you look. Emu’s in much more evidence now as are roos. Cattle are plentiful wandering along roads as none of these paddocks are fenced from the highway – well why should they be? It’s not like its the M1 here (except perhaps during the peak grey nomad season). There is still a tinge of green indicating that there has been recent rains even out here. 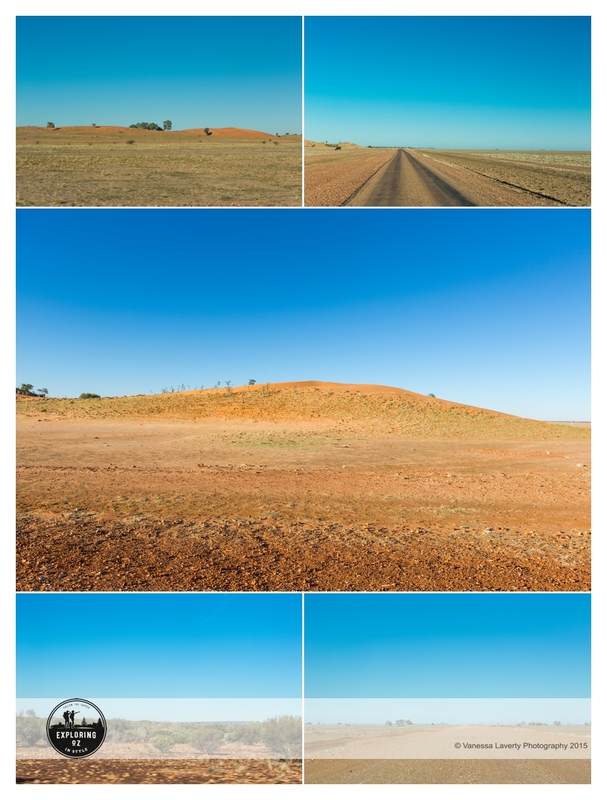 The colours of Australia: a tinge of green in the paddocks leading your eye up to the deep blue winter sky highlighting the red soil of the dunes simply made me sigh with the beauty of it all. Cattle wander the paddocks with complete freedom. This fence was as straight as an arrow so couldn’t resist the temptation to photograph it. I’m not exactly sure how it worked though – cattle crossed the road in front of us so it didn’t seem to be keeping anything in or out. 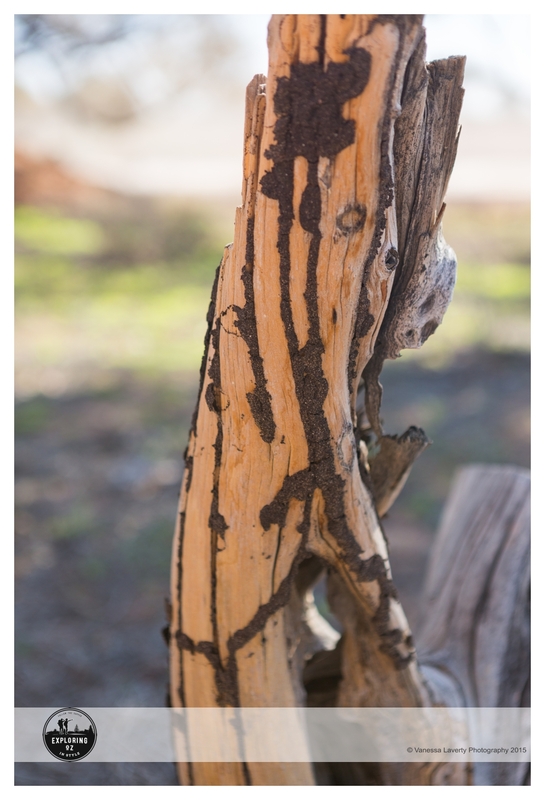 We stopped for lunch along the road and I was completely entranced by this particular tree with its curly bark. The light was gorgeous so grabbed the camera and shot off a few shallow depth of field frames. 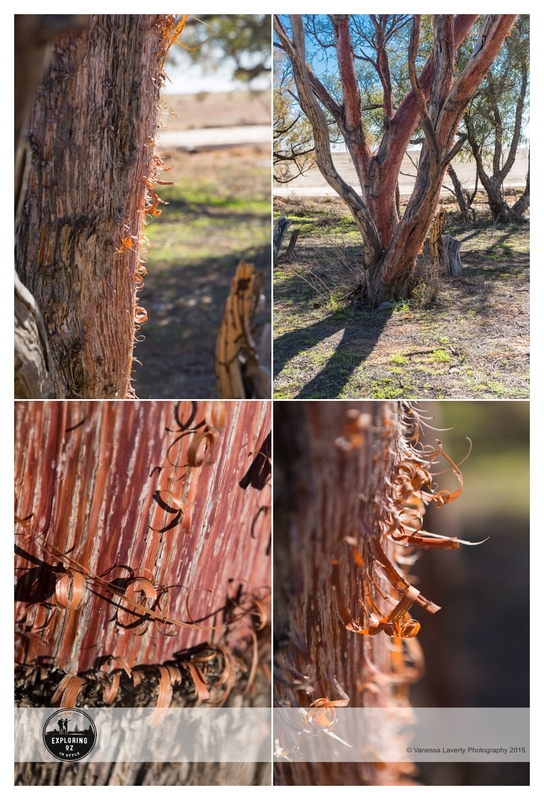 This tree’s bark also held my attention. The long long road ahead – gravel roads for a lot of the way but you can see they’ve been freshly graded. Aren’t the colours amazing? What struck us both out here was the complete lack of wildlife or any form – completely desolate. We got 2 flat tyres – at the same time! Are you serious? At the same time??? 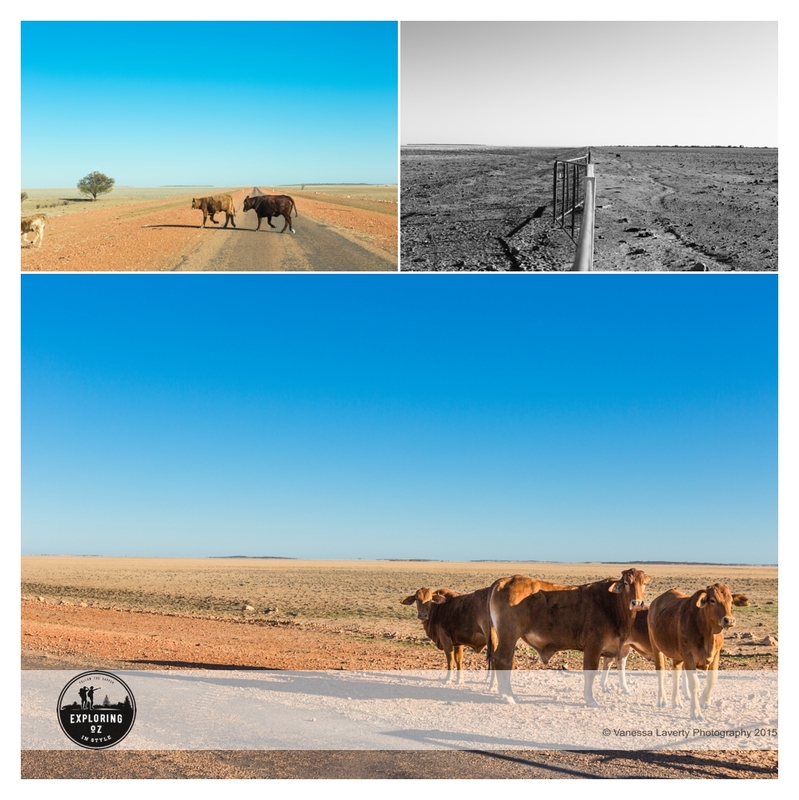 We were only 100km out of Birdsville – nearly made it! Pulled over to the side of the road and Damian got to work. I, of course, was of no use whatsoever as I had only had surgery on my shoulder a few weeks before and had absolutely no use of it at all. I sat by the car in the shade occasionally taking some photos to pass the time but really, the area was still desolate and full of nothingness – plus, it was hot. I felt for Damian having to change 2 tyres at once. He later confided to me that he hadn’t had to change a tyre since the late 90’s – then we got 2 at once. Go figure! Whilst he was changing the tyres, a group of cyclists rode by so I grabbed my camera and took some photos of some of the cyclists. I didn’t ask them to stop and chat but luckily for us, we saw them again at the Big Red Bash. It turns out they were a group of people who were raising money for the Royal Flying Doctor Service. 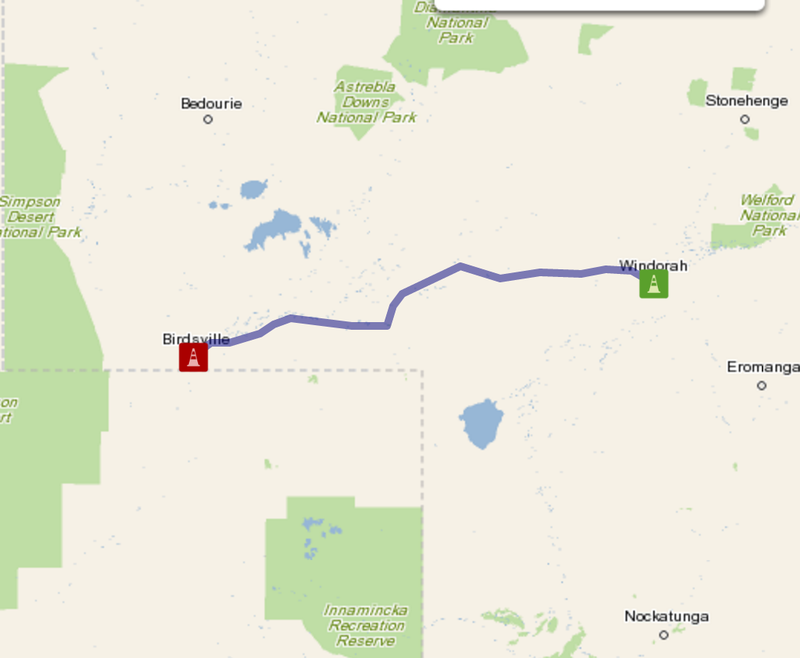 They had started out in Charleville on Saturday 1st July and were expecting to ride into Birdsville by the 5th July. Big ride! They had raised roughly $11K and were aiming to average 100km/day. Big effort and hats off to them. Arrived in Birdsville to find a hub of activity. First things first – can we somehow get our tyres fixed while in Birdsville? Not only can we get it fixed, but the service station has an entire area devoted to fixing punctured tyres – seems the roads have a reputation out here. You just line up with the rest of the unfortunates and get your tyre back within an hour or two – depending how nice and friendly you are to the tyre fixer man 🙂 If you’re rude and expect to jump the queue – bad news for you (as some people found out). If you’re friendly and polite, step right up and we will fix it for you now 🙂 By the way, those 2 tyres? Neither were able to be repaired so we were up for 2 new tyres – so left $500 lighter. The Roadhouse – the Grand Central Station of Birdsville. Everyone, but everyone, stops here as it’s the most obvious place to start in Birdsville. There is another service station around the corner and if you only want fuel, head around there as the line-ups are much shorter. 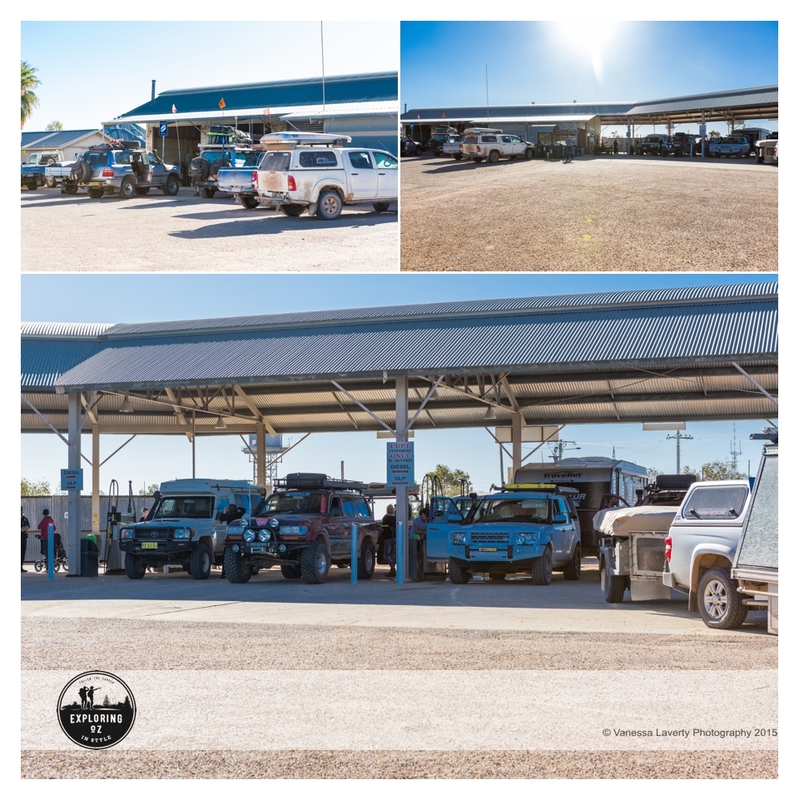 During the time we were there, there were often 10 vehicles lined up for each pump; more than a dozen vehicles waiting for tyres to be fixed and a massive line up in the general store at the Roadhouse. General Store – at the Roadhouse. Stocks the usual basics of a small town supermarket (there is no other choice – at least, not that we could see anyway). Be prepared to line up and allow plenty of time to get what you need at the Roadhouse, the store and the tyre repair joint. By the time we got there, the place was pretty much low on any kind of stock so got what we could. At this time of year, this place is hopping but you know that during the off season, not much happens here and the whole town relies on the dry season for their year’s income. The Roadhouse seems to be where people meet up and then there’s the main street. There’s a caravan park opposite the Roadhouse and it seemed to be fairly full. Some people had opted to stay there the night before the Bash started and to head out to the Bash on the morning it started – the idea being that they wouldn’t need to line up at the entrance point. We’d been told there was an hour wait to get in. The information on where to actually get your tickets for the Bash was a little scant so we asked someone else (of course, 90% of the people here were heading to the Bash). I was advised to follow the ‘millions’ of other people and I’d find the Information Centre in town. He was right – I looked right and all I could see was a sea of 4WD’s, camper trailers and caravans lining the road. There were people everywhere. The Information Centre – this looks to be fairly new, though I’ve never been here so I’ve no idea how old it is. 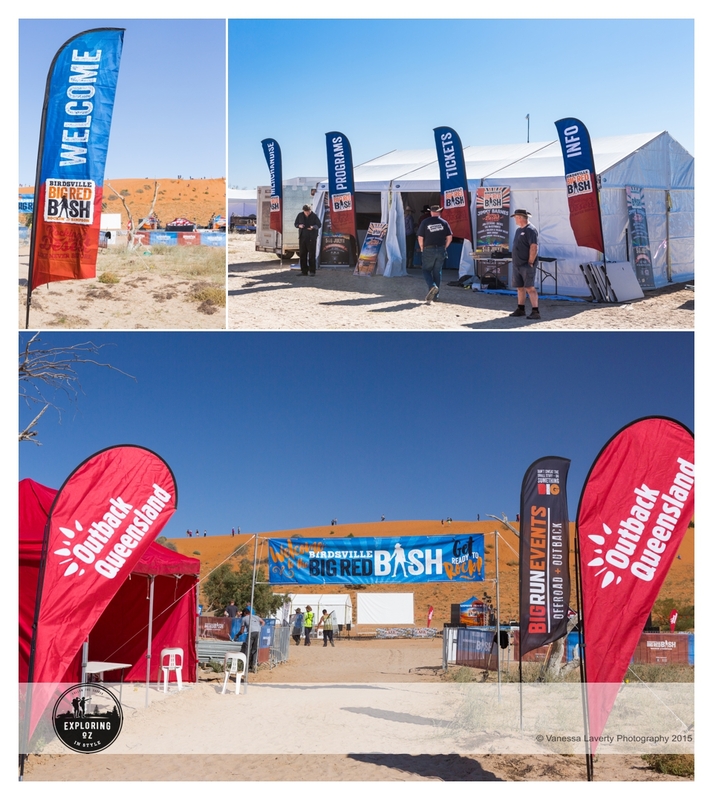 This is where you get your tickets BEFORE heading to the Bash – a fact lost of some people who turned up at the Bash with no tickets (I believe that’s been addressed for the 2016 Bash). We had pre-paid for our tickets and merchandise and I was very impressed with how well run this operation was. In and out very quickly. The Birdsville Hotel – Now, I’m desperate to photograph the iconic hotels of Australia (I know, I know – it’s all be done before – but the challenge is to photograph these hotels in a different way to everyone else – that’s what an artist does) but really, there were so many people and vehicles around the hotel, I didn’t even bother getting my camera out. Damian headed in to get some supplies and we then headed out to Big Red to set up camp for the next 3 days. At last, we were on our way to Big Red. I’ve heard so much about this dune and now I was actually going to see it for myself. 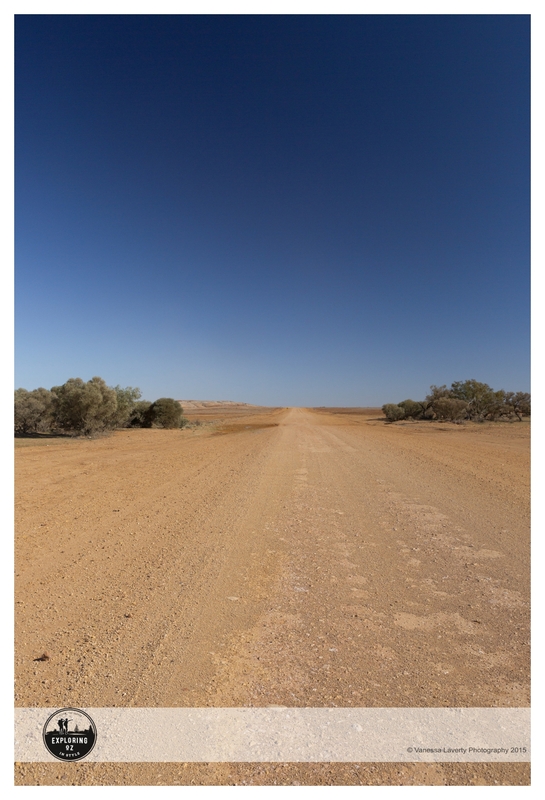 It’s about 30km to Big Red from Birdsville on a gravel road that was well graded – obviously graded with the knowledge that some 3000+ people were about to drive on it. Luckily for us, we’d timed our arrival well as there was no line-up and once we’d shown our passes to the guy on the gate, we sailed on through and drove around to select our camping spot. We decided not to camp too close to the stage so headed about half way back and found a lovely spot. 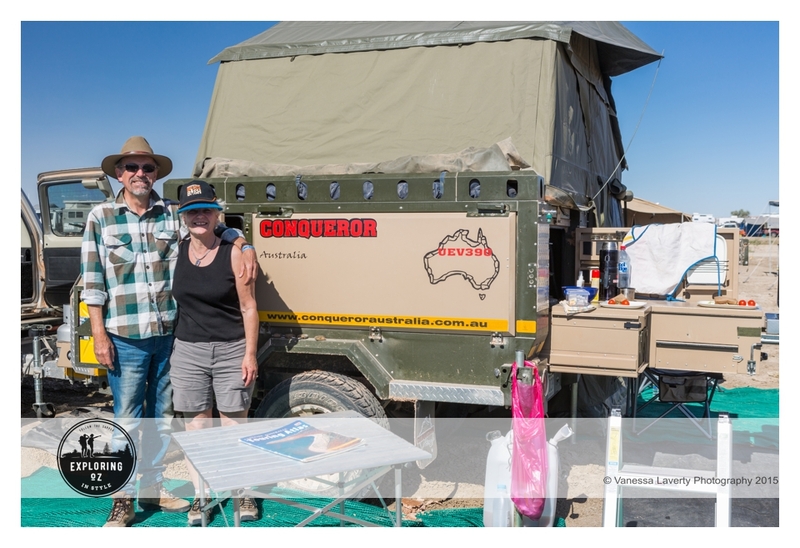 Luckily for us, we were camped next to a lovely couple by the name of Jenny & Chris who were from Melbourne and camped in a Conqueror. By now, it’s about 5pm and it really is getting quite chilly. Days are around 26° but the nights are well down towards 0° so a night campfire is quite necessary. Damian got the fire going (between us and the lovely couple next door) and the four of us settled in for a few drinks and stories around the fire. Let’s talk about the road conditions – roughly 400km should take about 4hrs and we were told to allow 7hrs+ due to the corrugations. The roads were in fairly good condition as they’d obviously been graded recently. With our 1/2hr stop for morning tea and our 1hr stop to replace the 2 tyres, we still only took 4.5hrs to do the trip from Windorah – pretty good going I’d say. This is PRIVATE PROPERTY and we were only allowed to camp here due to the Big Red Bash event. For the next 3 days, this is our home and the next posts will be all about this amazing event.